There are currently over 400 operating nuclear power reactors around the globe, employing approximately one million people, and holding all seven billion people on the planet hostage. Nuclear power is a very expensive way to provide electrons in wires. There are constant dangers from proliferation, terrorism, waste mismanagement, and accidents. There are NUMEROUS clean alternative energy solutions, but the cost of conversion is considered too high because we give nuclear power a free ride on most of its costs to society. Unfair competition is not capitalism, and nuclear power could never have started, let alone continued, under equitable economic conditions. It is the most subsidized industry in history. Also the most secretive, the most poorly regulated (it's mostly self-regulated, which is to say, utterly UNregulated), the dirtiest (even compared to coal), and the most environmentally invasive, too -- it's radioactive byproducts get into EVERYTHING. Nuke power plants are vulnerable to human error, and catastrophic natural events such as earthquakes, tornados, or even meteors from space. Unlikely? Yes. Impossible? Absolutely not. Statistical calculations of the probability of a catastrophic accident at a nuclear power plant caused by it being hit by a meteor are complex and unreliable. No matter what number someone comes up with, a group of bright scientists will undoubtedly be able to argue that the estimate is off by several orders of magnitude one way or the other! But NO MISTAKES are ever made when calculating the chance of a catastrophic accident caused by a meteor knocking over a bunch of windmills. The chance is zero. Such an accident would be tragic for those under the meteor's fireball, but it would not effect one millionth as many people as if a meteor hit a nuclear power plant, or if the power plant's radiation was released for any other reason. Since there are safe alternatives which are cheaper and more reliable, I believe that even the small (some might call it "remote") chance of a meteor strike on a nuclear power facility or its waste is enough reason to reject nuclear power for humanity. Look at the moon. Those craters you see are meteor strikes. Our planet's dirt and wind and rain covers the evidence of these strikes, but the Earth is regularly hit by meteors, too. And there are at least 1000 other reasons to reject nuclear power, all of them at least as good as the argument that meteors can and DO strike earth with some regularity, and no containment dome can seriously be thought to protect the power plant from such strikes (noting that the domes are not very thick on the top, anyway -- only the BASE of the walls is 8 feet to 12 feet thick, and also noting that most of the radioactive waste is stored outside the containment domes). * Yucca Mountain is located in an earthquake-prone area. It's one thing to risk your own life by living in an earthquake region, or a tornado region, or a tsunami region, but to risk the health and safety of the whole planet by storing all your waste in such a place is another matter entirely. * Water runs through the Yucca Mountain site more quickly and in greater volume than originally expected. Water degrades the metals, or can cause a steam explosion -- releasing a planet-killing quantity of radioactive waste into the atmosphere, perhaps thousands of years from now, perhaps sooner, and perhaps not at all (if we're lucky; but do we want an energy plan which REQUIRES us to be lucky?). * Transporting the nuclear waste to Yucca Mountain is not easy, safe, or cheap, but keeping the waste at nearly 40 separate sites around the country is ALSO extremely hazardous -- AND violates the promise made to the public when the plants were opened, which was that no waste older than about five years (the minimum amount of time needed for the waste to cool enough to be moved) would be kept on-site at the nuclear power plants. Instead, more than half a century into the nuclear age, the used reactor cores all remain onsite and very, very vulnerable. * Perhaps the biggest problem for nuclear waste management is that the scientific community is becoming more and more aware of the extreme dangers of radioactive particles inside the human body. Permitted exposures continue to drop, and this author believes they will drop much, much more as the public realizes how bad a little polonium-210, or plutonium-239, or whatever, really is for you (especially for children). The EPA ruled that the Yucca Mountain team's plan to create a massive radioactive blob, which, in 10,000 years (if not sooner), would begin escaping the mountain and contaminating the groundwater in Nevada for the next million years or so, was not adequate. EPA told the scientists and engineers that they have to extend the predictions out to at least a million years, which is just that much more impossible to do considering that the average nuclear engineer cannot accurately predict corrosion even a few MONTHS in advance (see "Davis Besse 2002" again, or consider the many problems with steam generator corrosion throughout the nuclear industry). Most of this year's Presidential candidates proclaim their opposition to "Yucca Mountain" but it's just a political football they are tossing around to each other, and have been for about 20 years. Yucca Mountain is a scientific boondoggle for the reasons given above and many, many others. But the presidential candidates talk about it as if we could just abandon Yucca Mountain and come up with something better. Yucca Mountain ALREADY is a "last resort," so if you oppose Yucca Mountain, you really should oppose nuclear power too, since there is no other solution to the waste problem on the horizon. And even if Yucca Mountain is built and filled, the following day each nuclear power plant would have a dangerous amount of waste on hand which would need to be guarded, protected, etc. for millions of years. So being FOR Yucca Mountain doesn't mean you've actually solved anything! But tell that to six Republican senators who recently introduced legislation to relax the safety requirements for Yucca Mountain. The bill would eliminate ALL safety requirements for the facility after 300 years -- in order to take advantage of (imagined) future technological breakthroughs! In announcing the proposed legislation, Senator Jim DeMint (R-S.C.) made the specious claim that opposition to Yucca Mountain was based on "politics, not sound science." It is not "sound science" to base the nation's energy policy on completely uninvented future technological breakthroughs -- especially ones that we've already been looking for intensely for more than 60 years, and have already put tens of billions of dollars into trying to find. The only real politics involved in nuclear power is the combined politics of greed and ignorance. Congressional and White House promoters of nuclear power have NEVER studied the facts -- they've always let nuclear industry insiders tell them the "facts." Shutting all the nuclear power plants down now would save lives, money, and global storage space. There is no time to wait -- every day, another 50 tons of spent reactor cores becomes waste -- deadly, solidified poisonous gas. There is no time to debate, and nothing left TO debate -- the facts are clear, including the fact that radiation is as much as 100 to 1000 times MORE dangerous (especially to fetuses and infants) than the current standards admit to -- standards specifically designed to ALLOW THE NUCLEAR INDUSTRY TO OPERATE, NOT TO PROTECT YOUR LIFE! There is no place to hide, the world is finite and crowded. Nuclear power plant executives quiver at only one thing: The truth getting out to the public. The author, an award-winning educational software developer and programmer, has interviewed hundreds of nuclear physicists and other scientists on nuke-related topics. He has a personal collection of several hundred books, videos, and government reports on nuclear issues, dating to the mid-1940s. San Onofre Nuclear (Waste) Generating Station is known as "SONWGS" to the well-informed, but only as "SONGS" to the local media, the plant employees, and the duped public. The unmentioned "W" -- the waste -- is piling up at the rate of a quarter-ton of NEW high level waste every day the plant operates -- about 5,000,000 pounds of "high level radioactive waste" is being stored on-site right now. There is no storage solution on the horizon -- "Yucca Mountain" is an unscientific boondoggle. San Onofre has two operating nuclear power plants and a revivable license for a third unit. Recently two top executives of San Onofre were forced to take early retirement at the plant, or face immediate dismissal (and loss of pensions). It's been poorly run for years. Local residents, regardless of what they call the plant, die of cancer, leukemia, heart disease and other ailments from the plant's emissions. The owners repeatedly claim the plant has "zero" emissions, which is utterly false even without a tragic accident. Right now one unit is having its steam generators replaced, which requires cutting a hole in the supposedly-solid, steel-reinforced, one-pour concrete dome. The new SGs are made by Mitsubishi Heavy Industries, Ltd. -- yes, the same Mitsubishi corporation which built fighter planes out of plywood during WWII! San Onofre is a legally-sanctioned killing machine -- an institution of death -- and yet no one from the plant has had to debate its value to society (or lack thereof) for DECADES. We COULD close it tomorrow -- and should. The extremely dangerous radioactive waste -- including fission products (split uranium and plutonium atoms, with EACH fission product ALSO radioactive) -- must be isolated from humanity for many millennia. The waste -- solidified poison gas -- is odorless, colorless, and tasteless. Spills are easy to hide. The nuclear industry focuses on one possibly-beneficial aspect of splitting the atom (it releases heat) and ignores everything else: Epidemiological studies, cancer research, logic, competing technologies -- a thousand things. Right now San Onofre is building a 10 million dollar control simulation center where new control-room operators can be trained, and older operators can be kept current on the latest failure simulations. But these simulations will NOT include numerous failure scenarios which are entirely possible but deemed too rare to be worthy of study. For example: A 7.8 (!) Earthquake, followed by a 200 foot Tsunami (! ), followed by a heart attack of the shift supervisor. Hardly an impossible scenario! But they limit simulated earthquakes to, say, 7.0, and Tsunami waves to 35 feet, and the shift supervisor only has a headache instead of a heart attack or nefarious intent -- and they seldom model everything happening at once. Nuclear power IS a crime against humanity and allowing the plant to call itself "earthquake-proof" just because it might survive weak and unrealistic government standards doesn't make it safe. There are plenty of sustainable, cost-effective, reliable, clean ways to produce energy. Nuclear power isn't one of them. The author is a former real time heads-up interactive machine-language laser systems human interface guidance control programmer, but these days he's more likely to be found building award-winning educational Internet solutions in Flash. My local paper, the North County Times, refuses to publish the essay shown above, which was written as a 500-word "Community Forum" for their paper, unless I provide "proof" for a long list of points which their editor questioned. The type of proof required is also completely unreasonable. For example, to prove that the plant's releases have caused cancers in the community, I have to find a scientific study (and a press release and news report to go with it) about San Onofre specifically -- it cannot be about any of the 440 or so other nuclear power plants around the world, or even any group of plants! Nuclear deaths are extremely easy to hide, but OF COURSE THERE IS HARM. You'll never know who (random people here and there in the population), but to put an exact number on how many, you FIRST have to know what is being released, and San Onofre hides nearly ALL of that information (and the North County Times hides the rest). The NC Times' editor would not accept a scientific citation or a quote from a government web site stating that radiation is dangerous in any amount, even if accompanied by their own news reports of admitted releases of radioactive materials from the plant. So even the government's own BEIR VII report cannot be used! The editor would not accept an email address for an epidemiological expert he could contact. He would not contact the plant and ask them to verify anything. The editor also would not accept a call from a plant worker who might be willing to put their job on the line to verify the facts provided about the plant. Imagine if I were suggesting that the diesel rail line should be electrified. Would I be barred from stating that the diesel fumes kill children (and other living things) near the tracks, just because nobody had bothered to study the effect in North County specifically? Of course not! They even wanted me to provide "proof" that the plant really has "about 5,000,000 pounds" of spent fuel on-site. (It does -- about 2500 tons -- give or take a couple of hundred tons.). AND I also had to verify that Mitsubishi really made fighter planes out of plywood during WWII (they did, and it was their favorite Kamikazi airplane, too (the Zero))! After a call to the editor at the NC Times, this last request for "proof" was rescinded. However, many other ludicrous demands for documentation were left intact and others added -- and I was not allowed to fax him "20 pages of technical stuff" with or without circles and arrows and asterisks. It had to be a nice, concise news report or press release for each of about 20 different points. Funny, the other side can say anything they want -- nuclear plant operators can claim "zero emissions" AND at the exact same time, release about 10,000 Curies of tritium annually (plus a whole lot of other radioactive crud). 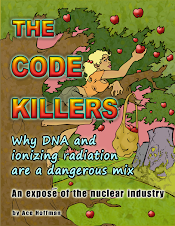 Radioactive substances permeate our lives, and are potent causes of cancer. The current radiation safety standards are criticized as being way to lax by numerous highly qualified scientists with thousands of years of experience between them, and scores of studies to back them up. The real effect of radioactive emissions on humanity is enormous, whether the emissions come from weapons testing, weapons use, power plants, research facilities, or the transportation, blending, purification, and other support industries. You should get to live to be about 100 years old. Cancer-free the whole time. Anything else is a bill-of-goods. A raw deal. Industrialized murder. It's really too bad the local newspaper is not interested in exposing the useless causes of cancer in its community. The only "benefit" from nuclear power is electricity, which can easily be obtained from far cleaner sources that have no way to destroy vast swaths of the environment for thousands of years due to terrorist attacks, catastrophic events like earthquakes and / or tsunamis, or human error. Even one death is too many when clean alternatives exist -- and for electricity, clean, safe alternatives have existed for years, and the hazards from radiation have been downplayed and / or ignored for years, as well. There is one correction to the original essay I sent to the North County Times. I had stated that "three" top executives had recently been forced out, but I understand it was actually only two -- the key word there being "recently." One of the executives, Dwight Nunn, had an affair with an underling, and then promoted the underling ahead of a more qualified and more senior person. Photos were taken, a lawsuit ensued, and Nunn was forced out. But Joe Sheffo, the editor at the NC Times, said that even with all the details to back it up, I couldn't say anyone was forced to "take early retirement" or anything like that unless I could find a press release or news report about it.